Every block is cut to meet the customer's needs. For example, I wouldn't "Hog" out a 260hp motor on a heavy lake type boat and kill all the torque. And you wouldn't just skim a light race boat back half and leave potential untapped power. At JSRE, we know what works. We do not experiment on your motor! Have you ever looked at the way your 2.5 feeds with air through the intake plenum? It feeds in a straight line. Cylinders number 6, 5 and 1, 2 are always robbed of air. Let the pros at JSRE angle cut your intake plate(s) to help this problem and pick up 200 to 300 rpms. Let JSRE lap your reed cages on our Lap Master to make reeds seal better and extend their lifespan. Stop letting your bottom-end horsepower leak back into your intake area. JSRE also laps your sealing rings to eliminate crank drag. JSRE reroutes the water from your 2.5. Your motor will get rid of spent water through 4 hoses instead of 2. We reroute water away from passing across the tuner area, and send it to the water pump area via tubing. This has made a difference in the motor's ability to draft or scavenge. JSRE lightens the inner rotating assembly a whopping 100 grams X 6 (600 grams total). Along with the JSRE lightweight flywheel, your motor will pick up 200 to 300 RPMs. Plus, keep your high dollar motor from self destructing by breaking cranks and premature wear. JSRE will lighten and strengthen your rods by cutting the cast flashing off the side beam area, thus eliminating the tendency to crack and break under RPM stress. All rods are digitally balanced. We check for rod stretch and straightness. Also, we check the rod bolts to prevent bolt failure which can be disastrous to your high dollar motor. Pistons are cut on Super Indexer to insure consistency. They are cut and balanced with digital accuracy. No hand work! Pistons are given the JSRE angle cut at the intake ports to enable better top-end breathing, plus all sharp edges are chamfered to prevent cracking. A 45 degree bevel is put on the crown to prevent detonation. Wrist Pin holes are honed to ensure perfect fit. We perform a crack inspection and return to the customer or we will install it back on the rod for assembly. JSRE offers light wrist pins for your 2.5 Mercury motor. The stock pins are 107.5 grams. JSRE pins are 74 grams and stronger than stock with a 65 Rockweld hardness (Indestructible!) What better way to reduce reciprocating weight! 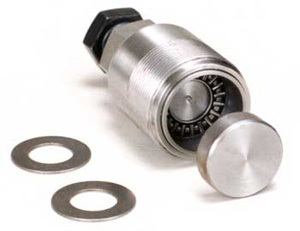 JSRE offers a new style flywheel puller with bearings to protect your crank shaft. A must for the do-it-yourselfer!